In a moment of high drama on the high frontier, flight engineer Donald Pettit, operating the International Space Station's robot arm, reached out and locked onto a commercial cargo ship early Friday after a complex rendezvous, a final sequence of approach-and-retreat test maneuvers and quick work to adjust critical sensors that were getting fooled by reflections from a Japanese research module. The last-minute hiccups were just that, nerve-wracking but relatively minor adjustments to correct for the real-world performance of complex laser and infrared imagers used to compute the Dragon cargo ship's velocity and distance from the station. But like everything in the world of manned spaceflight, where the stakes are high and the margins for error small, flight controllers in Houston and at SpaceX's Hawthorne, Calif., control center took their time, inserting additional checks to make sure everything was working properly. Now running well behind schedule, flight controllers left it up to Pettit as to whether he felt comfortable grappling the spacecraft in orbital darkness or would prefer delaying to the next daylight pass depending on lighting conditions. 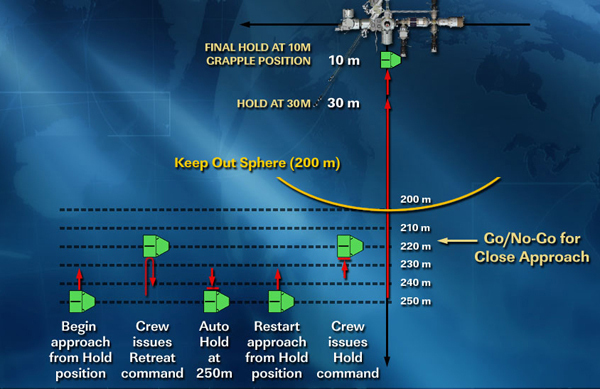 When all was said and done, the crew was about two hours behind schedule when the Dragon completed its approach, halting at a designated capture point 30 feet directly below the lab complex. One of its two laser range finders, or LIDARS, had been taken off line by that point because of suspect data, but the spacecraft was deemed healthy enough to continue the approach. As the huge space station and the diminutive cargo craft flew in tandem at 5 miles per second, Pettit, working inside the lab's multi-window cupola module, decided to press ahead in orbital darkness, guiding the arm's latching end effector onto a grapple fixture on the side of the cargo ship at 9:56 a.m. EDT (GMT-4). Internal snares were then tightened to secure the spacecraft to the arm, completing a rendezvous that began with Dragon's launch Tuesday from the Cape Canaveral Air Force Station. "Capture is confirmed!" NASA's mission control commentator, Josh Byerly, said as flight controllers burst into applause. "Congratulations on a wonderful capture, you've made a lot of folks happy down here, over in Hawthorne and right here in Houston," astronaut Megan Behnken radioed from Houston. "Great job, guys." "Houston, station, it looks like we've got us a dragon by the tail," Pettit radioed, then joked: "We're thinking this sim went really well, we're ready to turn it around and do it for real." 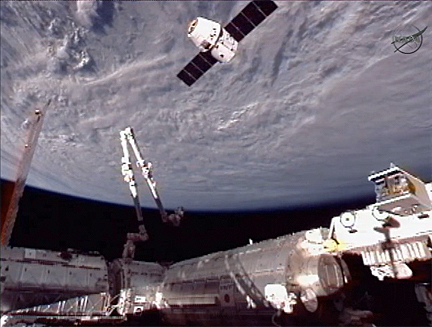 European Space Agency astronaut Andre Kuipers then took over robot arm operations while Pettit, using binoculars, inspected the common berthing mechanism components on the Dragon and the Harmony module to make sure there were no micrometeoroid impacts or other problems that would prevent an airtight seal when the spacecraft was locked into place. 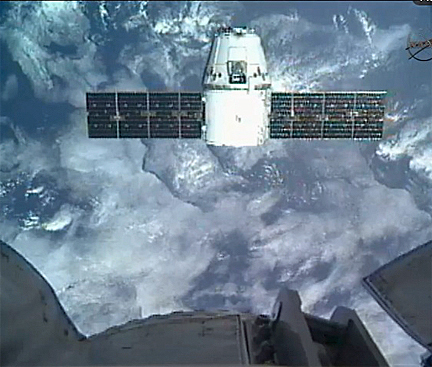 The inspections and maneuvers to align the two docking mechanisms took about two hours to complete. Just before noon, the crew was given permission to press ahead with "first stage capture," driving home motorized bolts in the CBM interface to firmly lock the cargo ship to its port on the space station. The two-step process was completed at 12:02 p.m.
Space founder and chief designer Elon Musk was almost at a loss for words during a post-berthing news conference. "This has really been the culmination of an enormous amount of work by the SpaceX team in partnership with NASA, and we're incredibly excited," he said from the company's Hawthorne plant, surrounded by cheering employees. "Really, I don't have words enough to express the level of excitement and elation we feel here at SpaceX for having this work. "There's so much that could have gone wrong, and it went right. We were able to overcome some last-minute issues with some fast thinking at NASA mission control and SpaceX mission control and got it there. It's just a fantastic day, a great day for the country and for the world. This really is, I think, going to be recognized as a significantly historical step forward in space travel. Hopefully the first of many to come." If all goes well, the crew will open hatches and float into the Dragon capsule on Saturday. For its initial visit, the spacecraft is carrying nearly 1,150 pounds of equipment and supplies: 674 pounds of food and crew provisions; 46 pounds of science hardware and equipment; 271 pounds of cargo bags needed for future flights; and 22 pounds of computer equipment. But the cargo was almost incidental. The overriding goal was to demonstrate the spacecraft's readiness to begin routine resupply missions as a commercial enterprise. "I can't tell you how proud we are to have been part of this historic moment," said space station Program Manager Mike Suffredini. "Many times as the manager of this program I have stood in front of you and spoken about historical moments, things that we have done that have never been done before, and this rates right at the top." Michael Lopez-Alegria, a former space station commander who now serves as president of the Commercial Spaceflight Federation, called the rendezvous and capture "truly a momentous accomplishment for SpaceX and for the industry. The entire team at SpaceX should be commended for their commitment and skill, and thanked for their contribution to restoring U.S. access to the space station." SpaceX plans to begin regularly scheduled logistics flights to the space station later this year under a $1.6 billion contract with NASA that calls for at least 12 missions and the delivery of 44,000 pounds of cargo and supplies. A second company, Orbital Sciences, holds a $1.9 billion contract for eight missions to deliver the same amount of cargo. The goal is to replace the cargo delivery capability that was lost with the space shuttle's retirement. While the station currently is supplied by Russian, European and Japanese cargo ships, the European Space Agency is only funding five Automated Transfer Vehicles and Japan's HTV is expected to see limited use after seven missions. The SpaceX and Orbital cargo craft "will do the lion's share of the work necessary to keep space station flying," said Suffredini. "And this is also paving the way to the work that NASA's been doing with many of the folks in industry to provide a similar service for crew transportation. We will almost rely exclusively on commercial provided services in the out years if everything proceeds according to the plan today. Three test flights were initially envisioned by NASA and SpaceX under a separate contract valued at up to $396 million. After the maiden two-orbit flight of a Dragon capsule in 2010, SpaceX lobbied to combine the second and third test flights into a single mission, with a close approach Thursday to test guidance and control systems and the final rendezvous today. "This is pretty tricky," Musk said before launch. "The space station is zooming around the Earth very 90 minutes and it's going 17,000 miles an hour. So you've got to launch up there, you've got to rendezvous and be tracking space station to within inches, really, and this is a thing that's going 12 times faster than the bullet from an assault rifle. So it's hard." But the NASA-SpaceX team made it look easy, with a flawless launch Tuesday, a smooth approach to the space station Wednesday and a successful series of tests Thursday during a close-approach fly under to verify the performance of the cargo ship's flight control system. The rendezvous Friday required a stepwise approach to hold points 1.5 miles and .9 miles directly below the station. The capsule then moved up to a point just 820 feet below the lab for another series of controllability tests, advancing, retreating and holding in place on command. 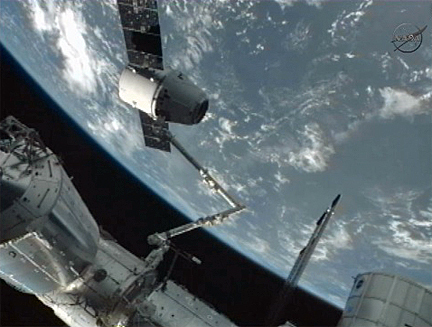 With the Dragon stationkeeping about 720 feet below the space station, NASA cleared SpaceX to continue the approach up the "r-bar," or radius vector, an imaginary line between the station and the center of the Earth. The original flight plan called for a brief stop at 100 feet before a final push to the robot arm capture point just 30 feet below the lab complex. But flight controllers wanted additional time to monitor the output of an infrared video system used in concert with a LIDAR laser ranging system to help the Dragon's flight computers calculate its distance from the station and its closure rate. Additional holds were ordered to make sure everything was working properly and even though one LIDAR was taken out of the control loop because of suspect data, the ship was healthy enough to proceed. "There were definitely some close moments where we potentially could have called an abort and in fact, there were moments where we had to retreat a little bit just to reassess the situation," Musk said. "We had to make some last-minute adjustments, in particular narrowing the field of view of the LIDAR. Fortunately, those worked. In very close cooperation with NASA mission control we worked out a solution that allowed us to go in and get grappled by the arm and berthed."